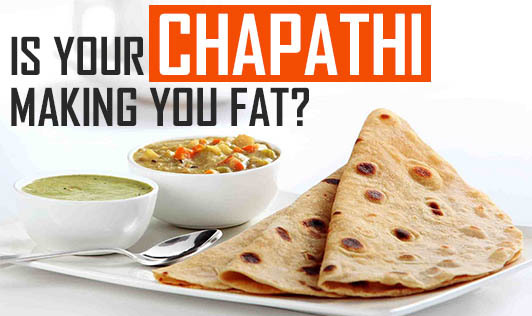 Is Your Chapathi Making you Fat? "I have stopped eating rice, I eat only chapathis now"! This is a common response I get from my clients trying real hard to lose weight! I was quite impressed with the dietary change that they were making. When asked if they had lost weight, a very few had, while some had unfortunately gained weight! I was initially convinced that wheat may be the better option over rice due to it's low calorie attribute. This changing trend of a number of clients turning into a wheat-o-holic, sparked off a little curiosity in me. This urged me to do some research. I looked into the calorie content of rice and wheat, and found the calories to be about the same. 100 grams of rice contained about 358 Kcal, while whole wheat flour contained about 341 Kcal for the same quantity. I also found that the other nutrient values between rice and whole wheat were about the same. While rice contained about 0.52 g of fat for every 100 g, whole wheat flour contained about 1.7g! This must come as a surprise to most of you!? 100 g of rice provides about 0.2g of fibre, while wheat gives about 1.9g! Again, it wasn't such a large difference for us to abandon our staple crop "rice"! This inclination toward wheat, I found was quite baseless. So should we really be substituting rice with wheat? Does wheat give us any benefits at all? Recently, an article I read by Dr. Mark Hyman, threw some light on the truth about wheat that I'd like to share with you. The wheat we get today is very dissimilar to the wheat of the decades gone by, that was known to possess some health benefits that present day wheat continues to claim. Wheat today has undergone genetic modifications, and it's natural proteins and starches have been altered. This starch has contributed an undesirable property to the present day wheat that increases your blood sugar rapidly, causing increased insulin production, and therefore problems that might result in diabetes. Another element, Gluten, a sticky protein that holds wheat together while making dough, has also been manipulated. This form of the protein is known to increase inflammation in the lining of the intestine, which in turn triggers an immune response. Once the lining of the intestine gets inflamed, the protein leaks into the gut. Our body identifies it as being a foreign substance and starts producing antibodies against it. When your body turns enemy to itself, it could be a very serious situation where your doctor will eventually diagnose as an autoimmune disease that increases the risk of diabetes, obesity, dementia, schizophrenia and cancer. Have you ever wondered why you can only eat a small quantity of a healthy fruit or vegetable but can never have enough of cookies and cakes? It's another effect of genetically modified wheat of the present day that could have addictive properties and this could result in you eating more. All the factors mentioned above have been under extensive studies recently, and are becoming reason to believe that wheat could be a trigger for the growing cases of obesity around the world. A client of mine had been suffering from Irritable Bowel Syndrome (IBS, a condition that has symptoms similar to gluten sensitivity) for a while, and he tried eliminating a number of irritants like caffeine, high fibre and spices from his diet. He had tried using medications to reduce the symptoms, but the problem was recurring. Since there is a possible connection between gluten in food and IBS, I suggested that he eliminate wheat and other gluten containing foods like oats, rye and barley for a while. The symptoms reduced drastically and he found great relief by just doing away with wheat from his diet. If you feel like your weight has been unrelenting in spite of all your efforts to reduce it, and you are one of those, who think that rice is the cause and has eliminated all forms of it, try eliminating any wheat products from your diet. Also, if you have symptoms of celiac (digestive, allergic, autoimmune or inflammatory disease), stop eating wheat products for a while and note any changes. With increasing studies in this area, eliminating wheat may turn out to be a practical solution for the treatment and reversal of obesity, diabetes and chronic diseases. Today's market offers a wide range of products that have genetically modified wheat. This sort of wheat is hidden in soups, noodles, pasta, wheat flour and many other foods. We may not be able to eliminate it completely, but as a health conscious consumer with so many choices to make, what do you choose? No single food is the best or the healthiest. The key is to get the best of everything. You have no reason to completely discard a particular kind of food from your platter. Strike a balance by eating all kinds of cereals such as ragi, rava, bajra along with rice and wheat products. A bit of everything is always better than a lot of one thing!